My nephew also wants me to make him a Stegosaurus toy. I'm trying to prototype one out and see what I can get. 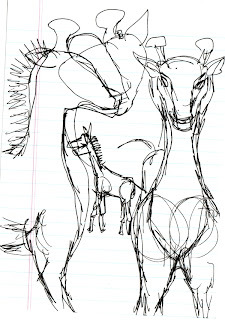 Somebody else wants me to prototype a giraffe for them and make a PDF pattern out of it. So that will be on my list as well. The side effects of that shot have worn off, I think... For a week there I was overtired and not interested in eating much. 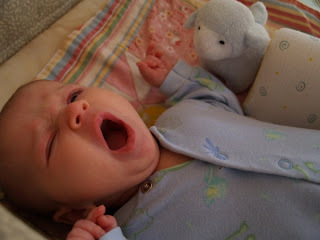 The last few days things have felt much better - I even took a mile or so walk this morning while Mark watched Esme nap. Note: Esme weighs 10 lbs, 11 oz this morning and is about 21 inches long. I growled at my sister on the phone Christmas Day because she said Esme looked 'too fat' in the picture she got. Babies are supposed to be fat! A skinny baby is an unhealthy baby! Grandma and Grandpa watched her yesterday while I went to the store to look at all of the baby swings. As usual, she was a little angel for them. I have told them they must have a 'baby sleeping potion' in their house somewhere. She gets really fussy, usually soon after eating, because her tummy hurts. Not much helps at those times except holding her and/or bouncing her, which is tough when we have time-constraints like bank and post office. I had been rocking her carseat carrier with my foot at those times she was cranky and I really needed to get something done at the computer. 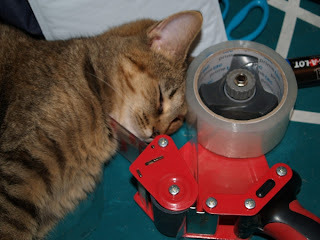 That worked pretty well, but when I get up to get a label off the printer or wrap a package she would often start to fuss again. When I have to get up I can set this swing on slow rock (which I think is kind of fast). I have to say this is a really good buy. Esme is nice and secure in it and you can turn the music on or off independent of the motion. I was worried she would be too young for a swing because she can't hold her head up continuously yet. 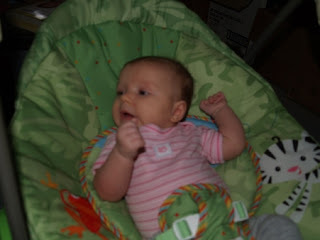 However, this swing is for birth to 25 lbs - and cradles her just like a car seat does. It also has a little mobile with two brightly colored stuffed creatures that hang from it. I wasn't going to hang the mobile up on the swing at all but when I tried it Esme was 'talking' to the creatures and wiggling all over. We are relaxing, with not much going on in the Ebay shop and not many reasons to go out of the house. We are going to try to avoid the stores all together for this holiday rush - no reason for us to be there and get run over! Playing EVE a little more. Mark did brave the stores last week to get an accelerated graphics card so I can play on my computer while he plays on his. It is a really detailed game with lots of opportunity for those who like to trade goods (me), create 'inventions' (soon!) and run about shooting up bad guys (Mark). We can even play together in a 'corporation' in the game and use both of our strengths to help the other. Esme is growing a lot - she is over 10 lbs now (10# 5oz last I checked) and making lots of different noises than she has before. I'm getting better at bathing her, which was one of the more difficult things for me up until I found a good routine. I got a b.c. shot at the doctor last week that will last for 3 months minimum .. and it has been making me quite tired, either that or I'm coming down with something. The tiredness started a few days after the shot so I'm thinking that was it. 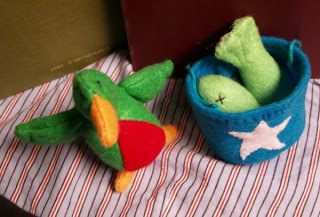 I'm also putting more energy into my Knitowl toy shop - as some custom orders have come in (and went out) and I've gotten a few loving reviews about my 'lead free toys'. 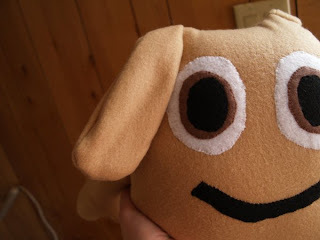 Cotton cloth with polyester filling and embroidered eyes... yea pretty lead free ;) I've had a few people suggest new patterns to try to make as well. We're not sure what is going to happen after the first of the year, but right now it is Christmas and we'll wait a week or so before we grind hard on that stone again. under the sewing machine and finished. Thank you Jeanne and Chris! Chris and Jeanne sent a very nice and sneaky gift! A STACK of bibs, interesting tea and groovy baby tunes on mixed CDs. Thank you, both of you! :) Such a wonderful gift!! Busy week here - dentist today and doctor tomorrow! Over the weekend Mark found the game EVE Online and has been running little trading missions in his spaceship. It is a very well cosntructed game with a market trading system I'm enjoying tinkering with as well. 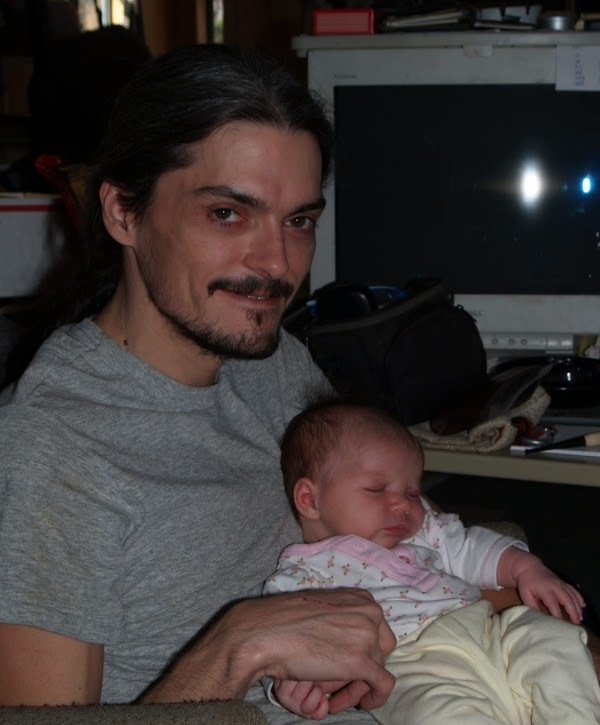 I called my brother last night (which is difficult, as he is hearing-impaired) and his wife said Elizabeth is 4 lbs, 5 oz. and they hope to take her home somewhere near the end of January. She should have been born at the end of January, so wow - she was very young and is still very tiny! They give her half of her food by bottle now, but then she gets too tired and they have to give her the rest through a tube. My brother says they get to hold her some now, but she is stil having trouble keeping her heat up for long periods of time. That's a lot of neck fuzz! We told her she looked like Jabba the Hut. 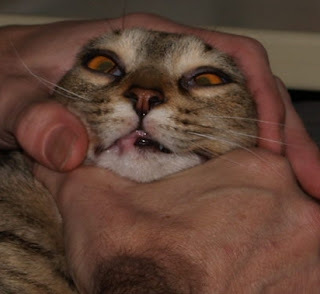 DISCLAIMER: No cats were hurt during this photo session. The worst part was we were laughing hysterically at her and she didn't think it was funny. She stalked off to the corner to flop down and stare at us balefully. We've had a few developments around here, but not much. Goofy, one of the girl puppies, went to a home. We hope it is a good one. We received some more assorted used inventory for our store in, and I'm going through the actions of getting pictures taken, descriptions written etc... I'm also throwing a few random items in my Etsy store every once in a while. We are trying to sell off some scrap metal that has been lying around the yard for years. We've been looking at parcels of land via internet around the areas we were interested in - but nothing to make us jump yet. The main problem is most of the places to rent don't allow smoking or pets, and we don't want to leave any of the dogs behind if we don't have to. Elizabeth is doing well - and they have moved her up from an eyedropper to a bottle. Wow, to be so tiny you can't drink out of a bottle! Modern medicine really has done a lot to help premature babies who would never have survived before due to problems as simple as getting enough to eat. We're not planning anything major for Christmas, as this is really our time to start organizing for whatever we are going to do early next year. It will be Esme's first Christmas but I think she is very happy with all of the love and care she gets and wouldn't know what to do with even the wrapping paper ;) She does enjoy looking at colored lights though, and Mark's parents gave him a little red/blue/green LED 'lava lamp' that she has enjoyed staring at several times. Mark did splurge and got the latest Harry Potter movie 'Order of the Phoenix', which we will probably get to this weekend. //off to describe modems, adapters and connectors. Have a great weekend! One of the things we knew we wanted/needed for Esme was a baby carrier, so I could take her around with me while I worked. A lot of things can be done one-handed, but not everything. 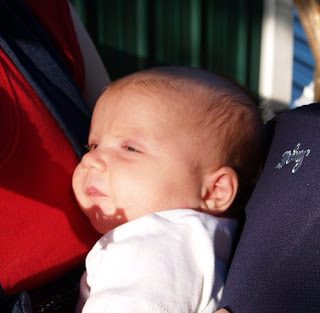 Mark's parents gave us this baby 'Snugli' carrier before she was born and I have been using it off and on. There was a point there where Esme's legs didn't fold up nicely underneath her in it anymore and yet she wasn't big enough for her legs to go through the slots. But now she can ride in it more comfortably again and I'm using it to do dishes, laundry, type Ebay listings etc... things I used to do one-handed or while she was in a deep nap. Esme woke up for a minute then dozed back off. When she gets a little bigger a carrier like this (instead of in arms) is going to be even more important just because of the weight! Sometimes carrying her around one of my arms goes 'to sleep' and I have to set her down or shift weight and get feeling back into it! 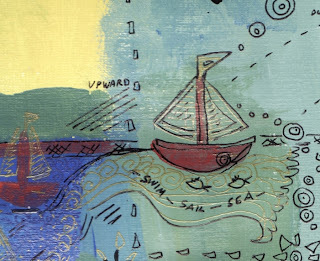 A small piece from my 6 x 9 mixed media card 'Travel' made today. 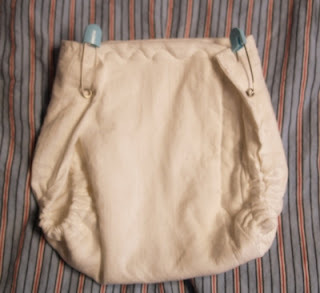 Rhiannon asked if I'd used any of the cloth diapers I made before Esme was born. 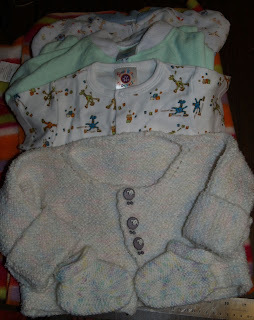 I thought this would be a good time to recap the baby things I found most useful, both handmade and store-bought. First, on the diapers, yes I've used every one that I've made. I wish I had made more than three or four, because I definitely don't have time to make many more ;) We mostly use disposable diapers, but the cloth ones are good to have around in case I'm certain Esme has 'more coming' but also want to get her cleaned up quick. The generic diapers are just as good as all the rest, especially when the baby is young (less quantity more frequently) I use the burp cloths to put under Esme while I'm changing her because they're small, thick and can easily be tossed in the hamper if they get dirty (without the bassinet blankets or Esme's clothing getting dirty). 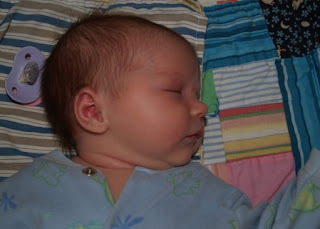 Out of the handmade things the burp cloths and bassinet quilts get used every single day. The little shoes didn't fit very well because Esme was so big - but I did get some use out of the red pair. Ditto with the blue pants and hats I made - they were all just barely fitting when Esme was born and don't fit her well now. The star of our store-bought items was the co-sleeper bassinet. 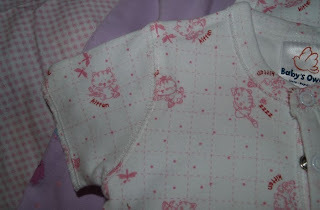 It has all those pockets in the side, and is very easy to grab Esme out of during the night and put her back in. I can drag it around the room really easily. I keep diapers in one side, and a wipes container in the other, and can get Esme changed without getting out of bed. The diaper genie we bought was actually a really good buy. It did take a bit of practice to learn to use it correctly. Baby washcloths and receiving blankets are washed at a frightening rate. You can get by on fewer clothes that fit at each stage if you have easy access to a washer and dryer. I think breastfeeding is much more simple than formula and bottles. The first couple of days were torture before there was any milk, and breast shields are necessary to get anything done. However, when Esme is hungry I can feed her without going through a huge process to go to the kitchen and get something ready for her. 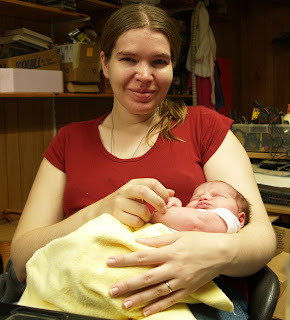 We did try to do the whole bottle sterilization thing a few times and save some breastmilk for later feeding - but I found it much more difficult than just taking out the time to feed Esme every few hours (which is possible because we work from home). Mrs.Pao: I think Esme really likes and can recognize Spot the Great Dane. I think this is because he actually stops and waits for her to notice him when he is coming to take a look at her - then gives us the biggest clownish grin and 'laughs'. It's the dog equivalent of going 'goo-goo-gaa' at a new baby and making funny faces. He is a very gentle giant, and often asks us for permission before he approaches - which is both sweet and amusing to watch. I'm very grateful he sets a good example for the others. Esme actually sees him now and I think recognizes him as another 'person.' The other day I was bringing her in the door in her car seat carrier, and Spot came to meet us. He gently sniffed her and Esme made that same happy 'Ah' noise I was talking about earlier, but to the dog, and started to wave her arms. Esme doesn't know the cats very well -- Pogo keeps wanting to tell me she can sit right next to her and be 'safe' but I'm not ready for that and have told her to hold off. The other day Esme was waving her arms and legs on the bed and Pogo was asleep nearby. 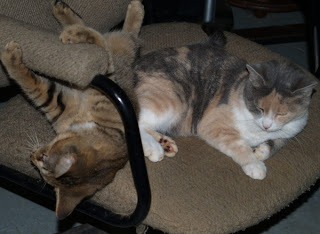 I was sitting right there watching them both and Pogo got nudged by a baby foot. 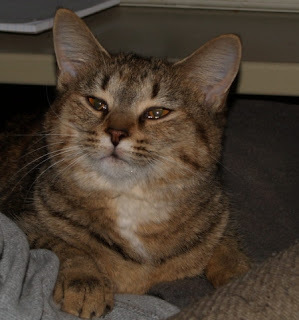 She let it happen a few times then very gently nudged back -- but I'm very nervous about even letting her get away with that and tried to tell her Esme was MY baby and she had to not do that.. I'm wondering how to deal with her in such a way that she will play nicely with Esme later and not feel like she has been replaced. First off: Happy Birthday Mark! He is very glad to be home and is thinking of writing up a narrative of his trip. There are a few places he was interested enough in to go back to for a more detailed look. He is really happy to be home and 'no longer rolling' constantly. She can grab my necklace, hair and things off the side of the bassinet now, like when I'm changing her diaper and put a blanket or piece of clothing up there for a moment. 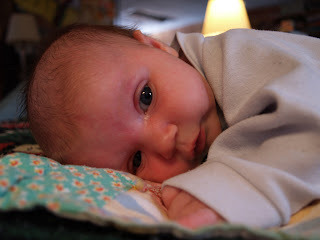 She can lift her head up for short periods of time while laying tummy-to-tummy but has a harder time on a flat surface. I think she has begun to recognize both us and the dogs and makes little happy 'Ah' noises sometimes when we come into view. Pogo continues to be a great help in the shipping department of our little online store. Mark is coming home today! He went over half the midsection of the country - through Arkansas, Oklahoma, Kansas, New Mexico, Arizona, Utah, Wyoming and Colorado. He did a stopover at a family friend's store in Utah to talk about some merchandise and maybe partnering up for some shipping and supplying later on. He saw the Very Large Array in New Mexico, and the Hoover Dam, and took some pictures. I had a dentist appointment today, which meant leaving Esme with Grandpa and Grandma, as Daddy was meeting with an old family friend at his store in another city. I was in a rush just to get to the dentist on time -- and barely did make it. About ten minutes after I had left Esme with Grandma I was already missing her -- and had to call on them just to hear about her before my appointment. The dentist office staff have been following along on the blog here and there so they already knew about her and I brought pictures for the lady who doesn't have a computer :) It turned out the pictures were kind of for me too, since I was missing Esme I stared at them in the waiting room until everything was ready to go into the dentist's chair. I was thinking I had a bad cavity on one side - but apparently it was several small cavities that could be sealed before they got deep enough for a filling - so, no novacaine! yay! They did do a thorough cleaning though, and after pregnancy hormones gums bleed a LOT, and boy mine did. So, glad I'm not having a thick lip for the rest of the night and that it wasn't as bad as it felt! 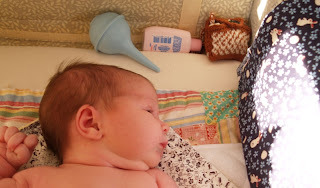 This would have been the first time since her second day home Esme would have had a bottle instead of me feeding her. However, she slept almost the entire time at her grandparents -- which was good for them but a product of her keeping me up all night last night. I swear she knows when I'm worried or anxious - she can feel it in my arms, hear it in my voice. She knew I was worried about leaving her, and about getting places on time - so she had a hard time relaxing enough to sleep. Now at home tonight she was fussy after she woke up, but got to eat and is happy again. Birth certificates here & now look SO different than mine from Minnesota. I remember the DMV guy here when I changed my license looking all over mine for a number and having to call somebody because it didn't have one. To me, it's weird that this one DOES have a number - and even a barcode. Wow, I find that a bit scary actually! My mom and the rest of the family got to see the little one in Minnesota this weekend. She is gaining weight - but still can't come home until she is 6 lbs. The nurses have nicknamed her 'Peanut' and she keeps pulling all her wires out, grabbing their fingers when they tend to her and taking off her hat and mittens. She sounds like an active little fighter ;) My brother and SIL haven't gotten to hold her much yet - as she is in that incubator, but I think the way they describe her grabbing at the nurses means she wants some human contact. My mom also said my brother's voice makes her stop in her tracks and look around - she wants to know where that familiar voice, daddy's voice, is coming from. Esme loves to hear her Daddy's voice as well, and stare at his dark eyebrows and sharp nose. I think she stares harder at him than she does me because his dark hair makes such a contrast. She loves lights too, and will focus on a bright light in the room when she is quiet and happy. As for human contact - besides all of our other mommy and baby time I'm making sure to take a half-hour or an hour here and there (when I can get it) to hold Esme tummy-to-tummy. She watches me for a bit, then curls up like a little frog and goes to sleep very happily. She is 1 month old now, and weighs 9 lbs, 7 oz today. I took Esme to town with me in the truck for the first time. No major events, just bank, gas, co-op and grocery store, but I'm proud of myself. Esme hardly made a peep anywhere, but was awake and playing with her hands at all the stops. Nice test run - I can do this as long as I take everything slow and easy. My brother and SIL have their baby girl today. The doctors took her by cesaerean section sometime early this morning at the Duluth hospital. She weighed only 3 lbs, so I am guessing she was very early (my mom _still_ didn't know how far along they were... *sigh*) The good news is she was breathing on her own. She will still stay in the NNICU at the hospital for some time. Mom is doing okay, but not feeling the best, of course after all of this emergency. My brother told my mom he would pick up the boys to go see mom and baby at the hospital this weekend. Got word today they'll be delivering my brother and SIL's baby girl sometime tomorrow - and she'll have to stay in an incubator until January, at least. My mom doesn't have too much info on it - but so far they've not gotten any 'bad' news. Their youngest boy Benji is 8, and he was worried mom and baby were never coming home - poor little guy they had the hardest time getting him to go to school today... but they were able to calm him down. He really can't wait to have a little sister. My brother and his wife lost a little girl just a year before they had Benji, so I'm thinking all good thoughts for them - hope this all goes smoothly and the incubator is just routine and not serious. Thanks to all of you for your good wishes too! It will also be very cool (agreed!) for Esme to have a cousin so close in age she could visit one day. My sister had a boy a year before Benji was born that now lives with his father in Oklahoma, but Benji and his cousin did get to meet once and had a good time together. My brother is taking off several days from work and going to stay with her in the hospital, while my mom keeps their two boys at her house. I'll call my mom again tomorrow and see if she has any updates. Mark has been getting things ready for his trip - and we're getting to where he will probably take off sometime this next week. He now has a mobile internet connection, as well as new tires on the vehicle, updated driver's license (his birthday is in the first week of December) and will be looking into getting his glasses updated before he travels as well. The mobile internet connection was quite a big deal. That should let us do our Ebay auctions from anywhere in the country. For several months, (nearly a year by some measures) we have been telling Mark's father he does need to get a new tech to manage the network system for his company. Up until recently, we also ran our Ebay pictures and some email off that same system. That system has been breaking, systematically, over the past several years. Usually Mark creatively 'tapes' the sytem back together or buys parts out of his own pocket to fix it if he can't get money for parts from the company. Our computer network is a complicated beast - it has lots of different parts that all run together to make the whole. A few months ago a major hardware part of the system broke, and right on the tail of that, another machine began to fail as well. They didn't affect immediate productivity (everyone still had email, internet, and most of their files), but they have affected things more and more as time goes on. We can't fix them, without a lot of scrambling and restructuring. We just don't have the time or energy to do it anymore. Mark's father has looked some for that new techie, but hasn't found anyone yet who can and will take on the job. Two weeks ago Mark stopped monitoring the things that are breaking. He had been watching system messages since September 1997. He can translate the messages from the system (attempts to connect, files not found, errors, memory allocations) into potential risks and alerts... This is no small task - as it requires constant diligence. He said it is terribly depressing to know what was breaking when he couldn't fix it. He will also be gone for several weeks and not here to fix it even if he wanted to. He shut down the messaging terminal with all that in mind. So, we are no longer fixing things OR monitoring the broken pieces. Mark's father called last night with another problem on the system and we really couldn't tell him anything. I felt bad, but he really needs a new tech to be able to call. Mark is going to be gone for several weeks - and I wouldn't know how to fix problems that deep in the system anyway -- I'm a software and internet geek, not a hardware geek. This system needs both. Most of this equipment is over 10 years old and running custom code and open source software. Some of it uses more electricity and puts out more heat than you could imagine. But, for the most part it works - and like a car held together with Bondo - it has done what it needs to do long enough to get us here. *sigh* but basically, this is the time we ALL (us and them) have to learn how new systems work, and how to get the same jobs done with whatever is out 'on the market' nowadays. We're doing that with our cellular modem and laptop. Mark's father will have to do that with whatever new tech he finds. Hopefully, this won't affect our family relations. If we continue to try to scrabble up fixes for the dying network with as little resource and time for other things -- that will surely break us down. And it won't help them in the long run either - as eventually we won't be here to call up and ask for repairs. If we don't stop doing things around here sometime, when will it ever become someone else's job? That sounds harsh... but there isn't any nicer way to say it. For years Mark lived what he describes as a 'monkish' existence. He thought he was building equity in a family business that had an honorable and attainable goal. He was helping provide technology services (internet publishing, email etc) to people in the property rights movement, to help them get their message out to the public. This was back in the very early 90s, when lots of people still didn't know about the Internet or how big it would become. Their family's website and magazine gave a voice and a forum to people who wouldn't have had it otherwise. He worked 24/7 on maintaining and monitoring the website and office network. It was a job that required constant upkeep and quick response time, and he gave it his all for ten years. Up until a year or so ago, he didn't even take salary above his household bills, assuming he was paying into the mortgage on the property he lived on in lieu of other compensation. That made for some interesting and frustrating financial problems for him, then and now. Now, he is disillusioned about the equity and partnership he was originally told he was participating in. He can't get a straight answer about things that were once said, and doesn't want to wait any longer for others to decide what they want to agree was the actual case. He is also upset that his father always wanted him to make his projects happen smoothly, but Mark's ideas and projects never got support. Or, even worse, the support was pulled from them after Mark had done a large amount of the work. It made him bitter and frustrated. This house we currently live in is one of those projects, although the building itself was successful. Mark built it on his own design, as the place he would live and work. He also put his own handwork into its construction. Now, he is told it isn't 'actually' his. He cannot get a deed to it because it 'belongs to the company', and was paid for partially by a grant given to the company. It has come down to the point Mark just wants something he knows is his, that he can put his hard work, heart and soul into and know that someone else can't take it away arbitrarily. 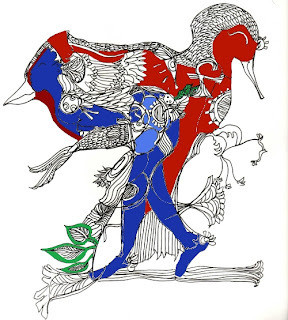 He has 'burned out' on this dream, and I want to help him in finding one we can both share. With Esme, we feel we have to take that action now, and start building a solid future. Wishing you all the best as well! 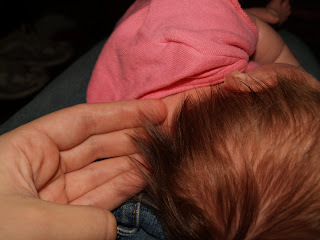 Esme's hair is getting quite long! Our new postal scale arrived in the mail, and the first thing we weighed on it was Esme. She now weighs 8 lbs, 15 oz, which is quite a bit more than last week! 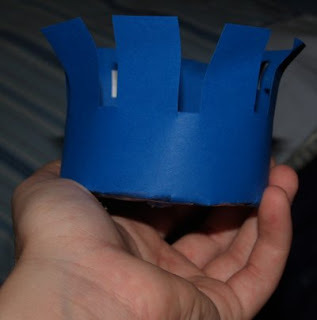 I cut out a circle, added a strip around the edge to make a cylinder, and cut strips in it at equal intervals. 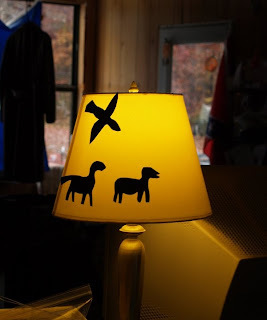 However, when I tried to place images in the places between the cutouts, it didn't really work like I thought it would :( Something larger, and much more exact measurements will be needed... or ricepaper that the light can shine through from the inside (like the lampshade above). Mark is going to the DMV and getting the vehicle ready for his trip out to Utah and other places West. He thinks he might leave next week if he can get everything ready. I have to go to the DMV as well *yuck* next week, as I still haven't gotten there to change my name on my driver's license. Time is really passing by quickly here! 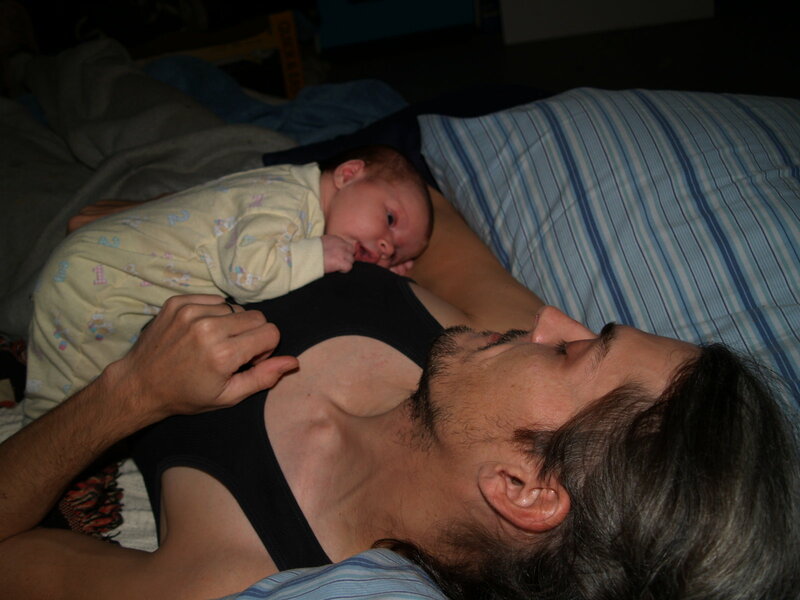 I told Mark a few days ago I can't believe Esme will be two weeks old soon. I said: 'Ever since those first contractions started, I feel like I've been living the minutes and not the hours.' He agreed we both are. The actual time we record in our minds has slown down immensely, yet the days somehow keep passing by almost unnoticed. And it's not just this beautiful baby that is making us pay attention to every little thing while the hours somehow slip away in the process... although she is the majority of it ;) We have a task list a mile long, and only so much time to do it in. We're transferring our store over to a new computer system, which means a lot of juggling in the next week or so. I have to learn the new system before Mark travels. I'm still not too good with the car, but I did drive the truck (also a stick shift) to the store yesterday with little problem. We're working at being independent at a time (new baby) when most people we've known were leaning on others around them for much more than ever. But, we know we have to do this, because we want something that is ours, totally, that we know we can continue doing together on our own ambitions, with less chance that it could be pulled out from under us unexpectedly. So far, we're doing quite well, but we're feeling the crunch coming up. We're stepping up our already busy days to get ready for the move. I'm almost ready to do that, but not quite yet. I'm sleeping better at night and Esme is on a much more regular, almost predictable schedule. Mark is working on a plan to go scout out several places we might move to. That won't be for a few weeks yet, but until then I have to get refamiliarized with driving the car and doing things for our shop. I have to learn to drive the stick shift without jerking it - and without getting stranded on hills etc... before I can go out with Esme in her car seat. I drove to the post office yesterday by myself. I have trouble with the stick shift in general, and this car has a starting problem as well. It gave me trouble three times just on the way back from the post office, but I was able to get it acting right again. I was going to go do some shopping today, but decided it could wait for another day. I don't want to leave my baby to go buy things that aren't immediately needed -- it feels silly, and she is perfectly safe and happy here with Daddy but I definitely had trouble letting go enough to make the trip. Esme had her first week doctor appointment today, and she actually gained weight! 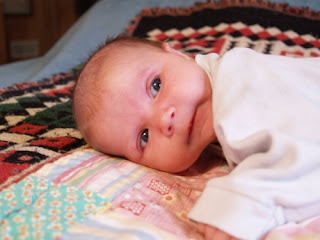 Some babies lose weight the first week, but she has gained 3 oz. 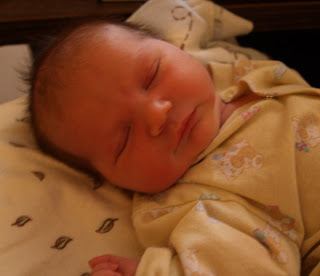 since her birthday (8 lb, 3 oz.). The doctor did her checkup and said she looks very healthy. She didn't even sqwuak much except when the doctor turned her over in midair (holding his hand under her tummy) to check her back. The little white bump near Esme's left eye is called 'milia', and should go away by itself. It was there when she was born and we had both wondered what it was when it didn't brush off. The doctor also said we're clear to do our move with Esme. My physical antibodies should protect her until she is about three months old. As long as we make sure she sees a doctor for her two-month immunizations, and I get my 6 week postaprtum checkup, we should be okay. We don't have to get those here, but we do have to make sure they don't get forgotten in all the shuffle. 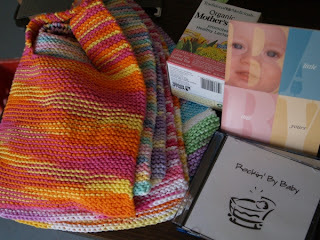 Lynn from Canada sent a wonderful package that was waiting for us when we got home from the hospital. What good timing! However, it took me a while to get it opened, and I apologize, a bit longer to get pictures taken! 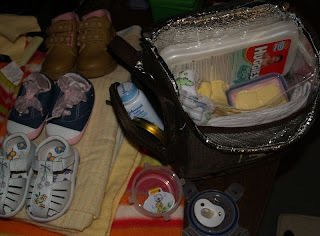 The diaper bag is really neat - Lynn took a lunchbox (with little lunchbox containers in it) and really packed the compartments full of useful and handy-to-reach things! There was a nice small 'Nuby' bottle, but it's already in the dishwasher. Sleepers and a handknit baby sweater and booties! Labor Stats: About 33 hours. 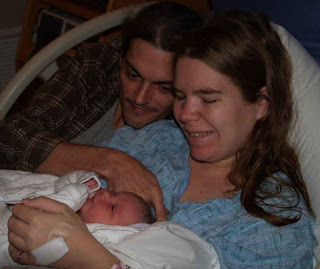 Labor started at 12:30 am on November 3rd, and was continuous until her birth at 9:37 am on November 4th. Pain management: I listened to Esme's heartbeat on the monitor, when it was on, to help ride contractions. I also used repetitious movements of my hands and feet, humming and, in the last hour, growling (yes, growling... it surprised me too) to manage the pain of the contractions. They gave me one shot in the middle of the night so I could sleep for an hour and a half as I had been awake for 24 hrs+ at that point. So, How was Childbirth? : My best friend from high school called me the other night and asked this question. What am I supposed to say to that? The first words that came to mind was 'I loved it. I'd do it again in a heartbeat.' It was a transition - and it meant keeping Esme safe and bringing her into the world. I didn't enjoy the pain, but it was purposeful and every step was something unknown to be passed through on the way to our little girl's birth. I think I disappointed my friend -- she expected me to complain to her maybe? I can't - things went beautifully well - unexpectedly well, and I am grateful for that for both of our sakes (Esme and I). 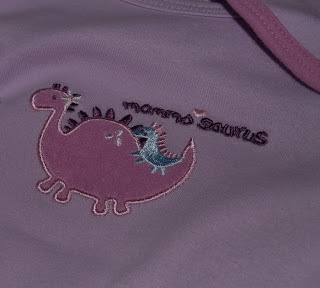 My first words as Esme came out (delivery): 'That was SO cool!...' I felt like a surfer dude saying that, but really, it was an amazingly strange feeling. The pressure was instantly gone, and I felt Esme unfold all her limbs on the way out with lots of liquid all around her. It was like a squid came out of me! 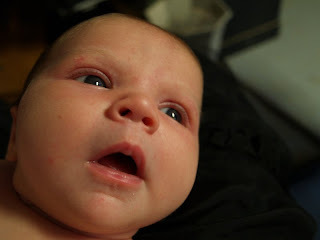 All of my fears of not knowing what my baby would look like subsided immediately - she couldn't look like anything but what she is, which is perfect. My first interaction with Esme: They laid her on my chest after Mark cut the cord. She was screaming her head off because they had just cleaned her up at the delivery station. I started singing her song to her as I looked at her and tapped the rhythym out on her back. She quieted immediately and started staring at me with this 'Wow' look. When I put this bunny fabric up she gets really happy and starts to reach out to grab it - then she shrieks in delight because she gets hold of it or cries in frustration when it slips back out of her grip. And this is at six days old. Amazing. 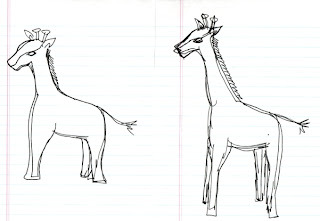 This drawing was actually done on the night of November 2nd. I had been in 'pre-labor' since Halloween night, with the contractions coming and going. This was done between the last spell of pre-labor and (what was to be) the real labor that started in just after midnight (morning of November 3rd). 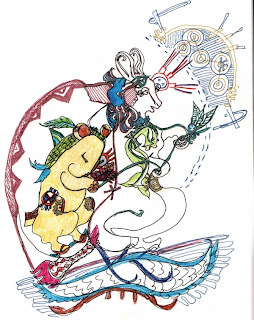 So, just to make it clear, this drawing was made before Esme was born, while she was still inside me. Since I know these drawings are VERY hard to tell anything apart in - I've included an 'emphasized' version with some digital color added. Although, it might not help much. The area I made in lightest blue surprised me (happily, to tears) that night, too - as it looks like a baby head-down in the womb of the woman (darker blue). 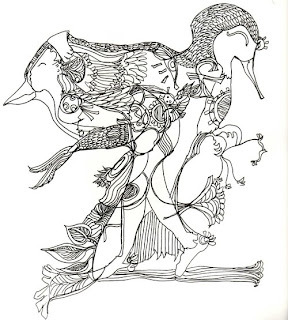 The bird to the right was a 'hummingbird' like creature and the bird to the left is like a mask or costume, giving some aspects of the bird to the lady inside. 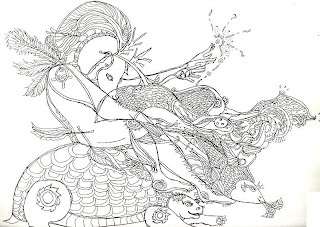 There is also a fish to the left of the 'baby' figure, which is symbolic to me because I often described Esme's movements in me like a fish flopping, and in some cultures I studied in my anthropology courses fish (and rabbits, btw) are symbols of fertility and children. Again, these are my drawings that begin with an uncontrolled set of random lines, drawn to a rhythym (my grandmother's song, now Esme's lullaby) on the paper and then slowly filled in over the course of a few hours until every line is used. She is keeping me really busy, but she is also so sweet and alert. Well, I caught her sleeping here ;) I'm pretty sure I couldn't ask for a better baby :) I'll have details on the birth at some other time, but that was also amazing and went 'surprisingly' well by the comments of the nurses, doctor and midwife at the birth center/hospital. As you can guess, we've been '24/7 Esme' since she was born, and that is a wonderful thing. I'm getting used to taking care of a baby, which I was pretty worried about. The last baby I 'took care of' was my sister's when I was eleven years old. She was eighteen, and upset/anxious about everything. She got angry really easily with everyone, even angry at the baby - so it wasn't a good experience. But Esme is ours, and that makes a world of difference. Sleep? It is really difficult to sleep now that Esme is born. And I don't mean she is waking me up crying... sometimes she barely has time to make a noise before I'm there. Mark is helping a LOT. I admit I'm kind of 'hogging' her, though - my instincts are to always have her in sight, keep her safe and keep on the alert to take care of her next need. I keep jerking awake when I try to nap, even when she is settled. I'm surprisingly alert most of the day (and night) for a total of about three or four hours of 'jerky' sleep. All that with no caffeine involved -- which is hard for even me to believe. Mark has made sure I can get a few hours here and there to _try_ to sleep, which really does help. I'm up and around the house, taking care of her and myself, keeping up dishes and laundry when she takes short naps - but everything else was at a standstill and might (might) pick up a little more in the next few days, but maybe not for a while. Now that I have more milk to give her she is sleeping longer at a whack - which helps on all fronts. We are breastfeeding, and that was quite a bit of anxiety for me but today especially things worked out much better. I learned a few things between yesterday morning and today that I'll list here just because they really helped. Continue drinking two teacups of Red Raspberry Leaf Tea a day to help bring in milk. Drink LOTS of water - if you're dehydrated there won't be any/enough to give baby. A very warm (not hot) washcloth before feeding for the first few days. Place it between the collarbone and the breast you'll feed from next. Aiming to make sure she has her tongue DOWN and not curled or raised up. If I swing her back and forth in my arms she throws her arms onto her tummy - which gets them out of the way. She has LONG strong arms! I can rub a finger behind her ear (not just on her cheek) to get her to turn that way. SIDS more prevalent among infants with American Indian blood. pH of breast milk is 7.2, slightly basic or alkaline this science article says why that's important. This is our Esme, (Esmerelda Mona Lisa), our work of art and love. Everything started really rolling along at 12:30 am Saturday morning. At 3 pm, we headed to the hospital. She came on her due date at 40 weeks even, surprising everyone, including me. Still in 'pre-labor' and resting up. Baby Bazooka is moving a lot, and we're just waiting for things to get close enough together to go to the hospital. Hope to have good news for you sometime over the weekend, otherwise ultrasound on Monday. By the time they were ten minutes apart I had that little card ready to call the hospital. But, I was really tired, and they weren't increasing in strength, just frequency. Even the hardest one didn't make me hold my breath through it. So I laid down to see if I could sleep at all - and after about a half-hour they stopped coming and I slept through the night. On a side note - she was active throughout those feelings and I've felt her move around since I've been up this morning, which makes me feel really relieved and certain it was just a false alarm. Still no baby, but the doctor says it should be soon! Well... that is, within the next two weeks still. Lynn said she wanted to see another picture to see if the baby has dropped any more since 37 weeks. Baby Bazooka is SO active lately and yet I'm not sure what a contraction is, so we're not sure if I'm having any. I'm feeling a lot of pressure that comes and goes, but it's concentrated on one side and not very regular... hopefully it isn't too long now! 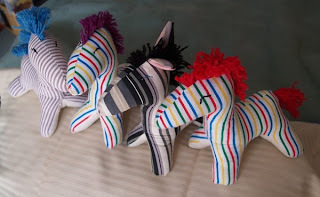 I'm making zebras for Jeanne and another custom order (maybe) for the shop. 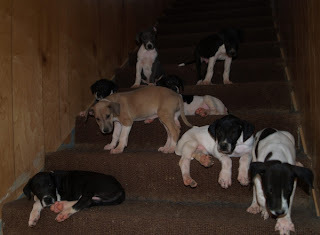 It was too cold yesterday for the flea market and we still have 8 puppies! A Big Move - to Where? Mark and I are looking to open a brick and mortar type retail shop. 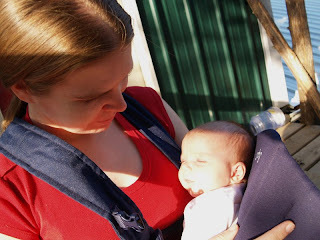 We've been discussing this since last year (well, January of this year actually), but there have been several things, besides Baby Bazooka, that have kept us from making any decisions. If we had been able to tie those things up before, we wouldn't have waited so long. Now, we're waiting for Bazooka to arrive, and trying to make plans on what information we can get through the Internet and friends. We're not even sure exactly what region of the country we would like to be in yet, but we do have some criteria. One of the hardest things is I can't travel very far to check anything out, and probably won't be physically able for a month or so after the baby is born. However, we would really like to know where we are going before December rolls around. We would like to be have our store near a population center but live a little further out of town in a 'farmland' type area, on an acre or more. If we could have the store and house on the same property (say off a highway exit or intersection) that would be ideal. Our store would be a mixture of computers, electronics, coffee shop and workshop facilities. It would be a unique kind of place, with both parts and materials to buy, coffee and snacks to hang out in the lounge area with, and maybe classes and projects going on by local artists. Think about sitting in a coffee shop while people next to you build a Rube Goldberg machine in one corner and other geeks take turns between LAN gaming and fixing their machines with shop tools. There might be a 'yarn bar' and an assortment of basic art materials for sale, as well as promotion of local artisans and in-house reference materials on a variety of crafty and technical subjects. Of course, this would be our ultimate goal. We'll have to start small. Our Ebay store is already getting to the point where we can rely on it for a little bit while we get settled. Where we go will definitely direct how much we can do how soon. But where to go? Neither of us have real strong feelings about location. We've been looking at a few different regions of the country but would like suggestions! Near high population but still some rural land nearby. A welcoming environment, we're both eccentric geeks and we're hoping to attract other like-minded people. Maybe near a university or technological center, people who want to learn and tinker with things. Moderate temperatures, not too hot or cold. I grew up in Minnesota and can't take really high heat, while Mark grew up here and places more Southern, so he avoids the colder weather as well. Invite your friends to give us some ideas too! We'd like to hear your opinions about different areas! Yesterday we bathed all 8 puppies and put them in the truck to bring into Paris, TN for a few hours. They had a Halloween event going on there at the Court Square. But, we still have all 8 - and they need homes soon! Look at how big they are getting! 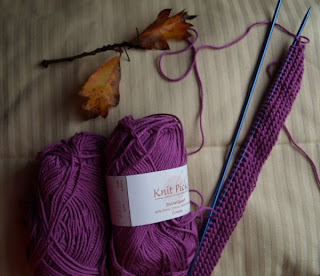 I won't say what this is an attempt at knitting yet, because if it doesn't succeed it will just be another soft cotton washcloth ;) The rain has finally stopped, if only for this morning, and I was able to take a walk again (with a sweater - it was a little chilly still). This baby girl is giving me more signs that she is wanting to come sometime soon - but still no promise of when. It could be days or weeks. Many more 'interesting' feelings coming and going and an alternating feeling of wanting to get things done and being very tired. Linky: A blog post from I live on a farm with pictures of beautiful 'natural fall things' she has gathered near her house. We're playing the waiting game. Had another doctor's appointment today, and he told me a few things. If I make it to 40 weeks without going into labor he'll do another ultrasound to make sure things are all okay. They seem to be okay now, she is head down with a good heartbeat still, and very active. If we go a full 41 weeks without labor he'll take her one way or another, and more than likely by c-section :( But that is all yet to be seen. (*) When he said that, I imagined her maybe weighing 2 lbs more than a baby her same size/length - just because of all the muscle she is constantly kicking and turning about in me with! A few days ago I had my first 'tightening' feelings - like someone was grabbing my muscles under this big stomach and drawing them taut. It only happened four times, three little ones 10-15 minutes apart and one long one two hours later. They were completely painless, but it was difficult to move properly because the muscles were hard and didn't want to respond for a few seconds each time, like having your arm held back when you want to move it. I haven't had any more of those for two days. The doctor agreed it was a good sign that something was starting to happen maybe. It's been raining all week and I haven't had any chance to go for my usual long walk in the morning :( but that might help when it dries up again. They say a lot of walking can help things along! Arrr! Pirate LOLrus says Where's Me Bucket? 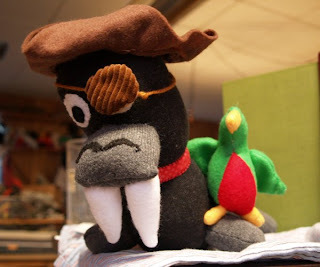 Pirate LOLrus says: Arrr! Where's Me Bucket? I'll keelhaul the blighter who stole me bucket! 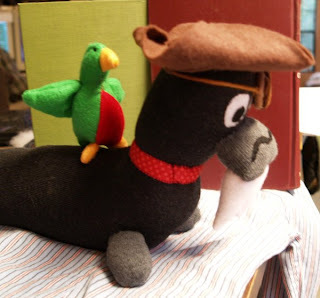 This guy will be at KnitOwl custom toys shop! 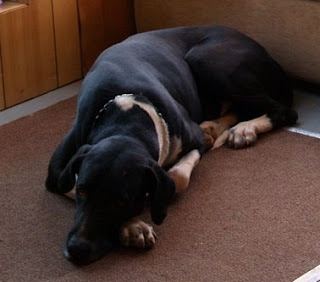 It's been raining two days straight here - and we couldn't take the puppies to the flea market again. 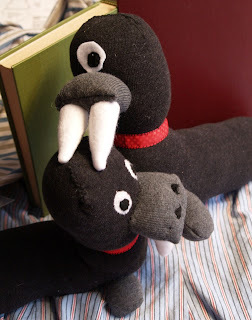 It seems like a good day to sit back and clean up loose creatures from the workshop areas. Fourth attempt at a cloth diaper - winner, I hope. I wasn't going to let the leg elastic beat me - and I think this came out pretty well considering the amount of actual work that went into it. Bringing this up to Mark's mom to ask her opinion today. 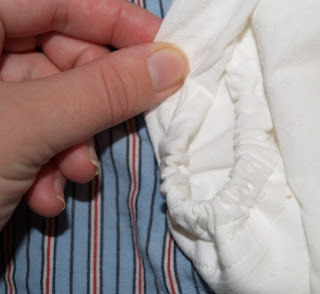 These can still have other 'flatfolds' or 'prefolds' put inside them, but I'm still wondering about sizing.